Following the successful poetry slam held at Thoor Ballylee late last year, Thoor Ballylee and its living poets are celebrated on RTÉ’s The Poetry Programme. 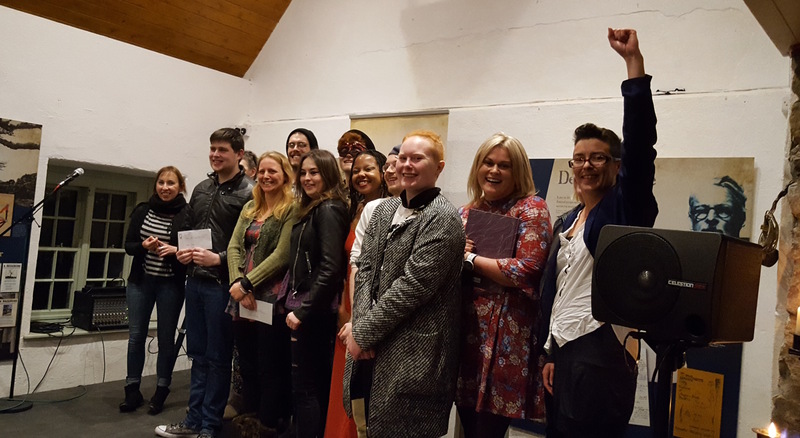 The programme samples the lively atmosphere of the inaugural Thoor Ballylee Poetry Slam and hears from organisers Lelia Doolan and Sarah Clancy. Paul McNamara, winner of the competition, is second from left. ‘Leabhar na hAthghabhála / Poems of Repossession’ is an impressive anthology of poetry in Irish from the past century with English translations. Editor, poet, and translator Louis de Paor chooses some poems from the anthology and talks about his desire to make this work visible to a wider audience. Martina Evans is sure we all have a poem in us. She talks with Rick O’Shea and reads from her collection ‘The Windows of Graceland,’ published by Carcanet. To listen to the programme, broadcast on RTÉ Radio One 7.30pm Saturday 7th January, follow this link. 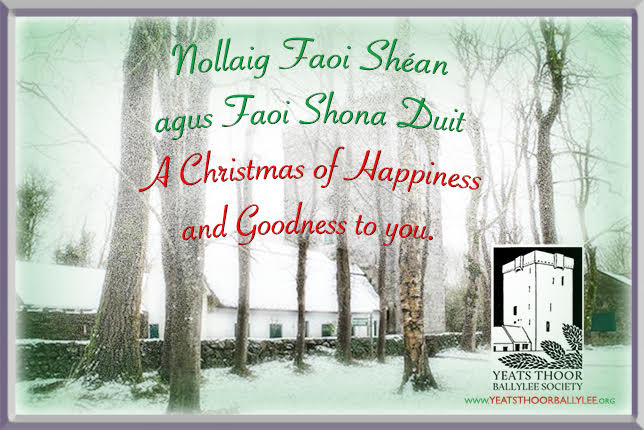 The Yeats Thoor Ballylee Society would like to say extend warm greetings for the new year, and to say thank you for our the generosity and support of our volunteers and friends throughout 2016. 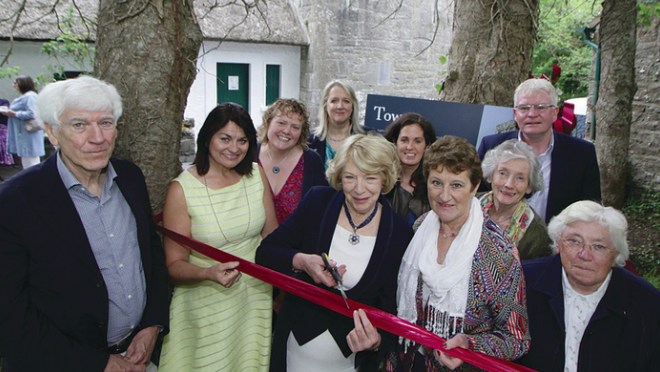 The doors of Thoor Ballylee were officially re-opened by actress Sabina Higgins in June with the unveiling of the new Yeats Thoor Ballylee Exhibition. 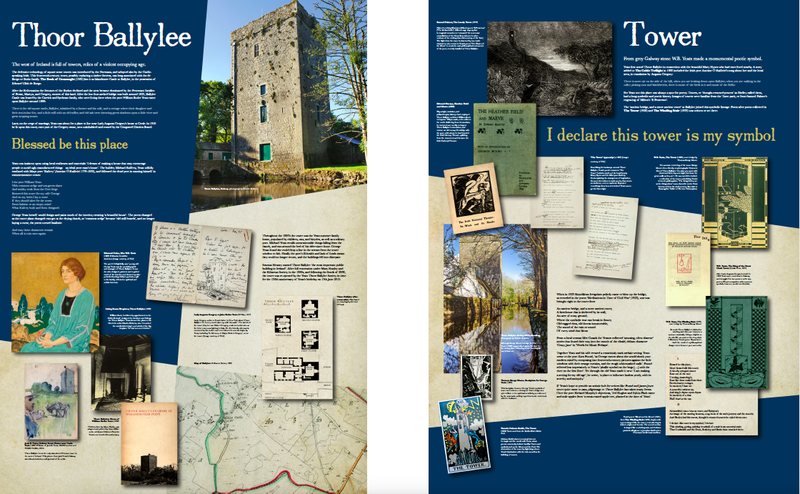 The exhibition, curated by Dr Adrian Paterson, Lecturer in English at NUI Galway, explores Yeats’s relationship with the people and places that most inspired his work. 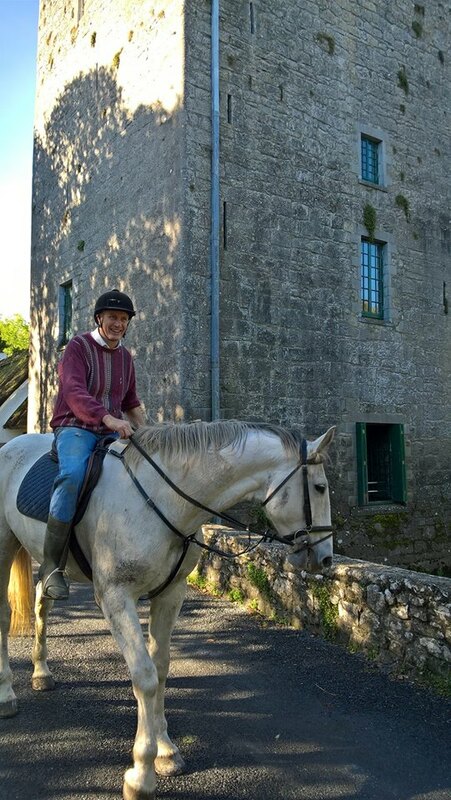 It looks at the culture of the west, its crafts, stories, and songs; the central importance of the women in his life, most especially of his wife George; and his close connections with the landscapes and people of County Galway, especially with Coole Park and with Thoor Ballylee. It also features exclusive material from Joseph Hassett’s inspiring Yeats and the Muses exhibition. Come down and have a look: the new exhibition will be available to view from the tower’s spring opening. This season Thoor Ballylee welcomed well over 3,000 visitors with the support of twenty local volunteers who guided and entertained visitors seven days a week. The Society was overwhelmed with the goodwill of supporters near and far throughout the year. US Senator Chris Dodd donated $10,000 towards the new exhibition in January. Donations have flooded in from friends near far helping fund the continual restoration and staffing of the tower. Our long standing benefactor Joe Hassett funded the publication of a magnificient book which tells the story of Thoor’s restoration in a collection of photographs taken by Deirdre Holmes. People like Anita Swanson who donated €1,500 to simply keep the Tower open has meant a great deal to us as we strive to keep the tower warm and welcoming. We also received a plethora of favourable testimonials and feedback. Throughout the summer, Thoor Ballylee was home to many artistic and cultural performances, playing a full part in the 1916 celebrations. The season kicked off onJuly 16th with a performance of “Yeats’s Women” by Dublin trio: Glynis Casson, fellow actor Daniel Costello and renowned Irish Harpist Claire Roche. Featuring original letters, poems, stories, and song, the performance uncovered in a dramatic interweaving of life and art the artistic collaborations and personal crises which the poet W.B.Yeats experienced together with an extraordinary cast of striking and hugely talented women. This was followed by the Wild Swan Theatre Company’s production of “Johnny I Hardly Knew Ya”, to a packed house on August. A weekend long series events as part of the Yeats and Lady Gregory Autumn Gathering included a production by the Curlew Theatre Company:” History! Reading the Easter Rising” (above). Our annual Culture Night event took place in September with performances from Gaillimh Theas Comhaltas, Claire Egan and Eoin O’Neill, followed by a special screening of a film “Words Upon the Window Pane” based on the 1931 play by W.B. Yeats, in which Jonathan Swift visits a seance. 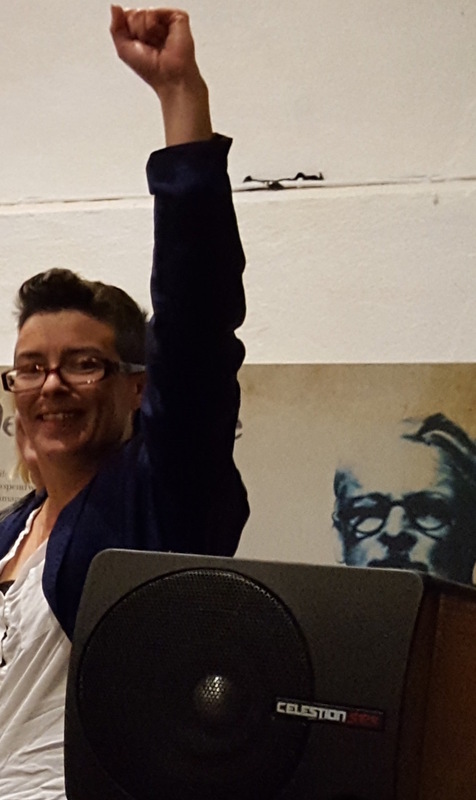 To bring the busy season to a close, Galway poets and former Cuirt Grand Slam winners Elaine Feeney and Sarah Clancy MC-ed an extremely popular grand slam poetry competition in October. It is your kindness as visitors, supporters, friends, volunteers and donors that have made this all possible – to find out how you can help further, follow this link. As many of you know Thoor Ballylee is prone to flooding – indeed when in January Bob Geldof visited to film a documentary about Yeats he had to be taken by boat! 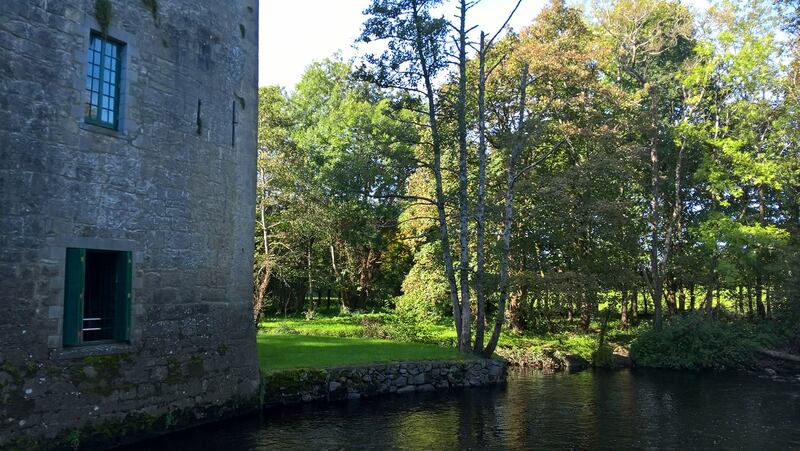 However, work is complete on preparing the tower and cottages for the winter season. This means that the ground level of the tower has been entirely cleared of its exhibitions and all movable goods. Permanent electricity and heating systems were moved above flood height earlier this year. All is dry at present, and the forecast is promising! Our aim is to re-open the tower in spring. Please keep in touch and check out further updates on this our website www.yeatsthoorballylee.org.